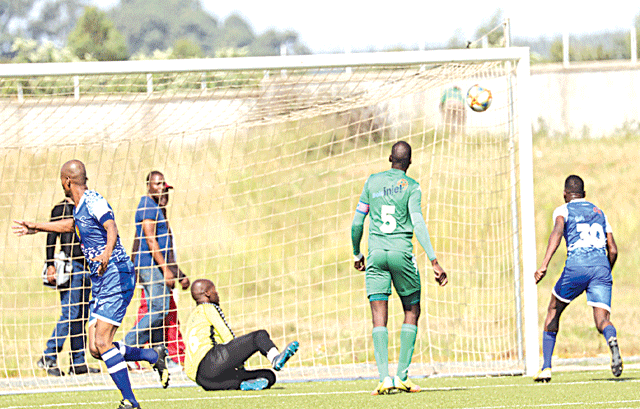 SOCCER – PHIWA Dlamini was the hero as defending champions Young Buffaloes left it late to beat a stubborn Manzini Sundiowns 4-2 on penalties to reach their third consecutive EswatiniBank Cup final. The match was played at the King Sobhuza II Stadium in Nhlangano yesterday, and nothing could separate both sides as it ended 0-0 in regulation time. Sundowns suffocated Buffaloes for much of the game, creating chances of their own in the process. It was an uncharacteristic performance by Buffaloes as they attacked with less vigour, allowing Sundowns to grow in the game. Sundowns top-man Linda Maphalala was a menace to Buffaloes defenders and could have caused a lot of damage had he been ruthless in front of goal. His first of many chances came in the 20th minute when he came face-to-face with the keeper but failed to find the back of the net. Sundowns matched their below par opponents in every aspect and it looked like they would rue those missed chances later on, but Buffaloes never really threatened. The best chance the army side created came in the 41st minute when Phiwa Dlamini broke free on the right flank but his effort was thwarted from a very tight angle. In a bid to seek creativity, coach Dominic Kunene brought on Ali Matse for Mpendulo 'Mpetha' Dlamini. There was no immediate joy for Buffaloes as Sundonws almost scored on the other end through Linda, whose caved shot skidded just wide. Sundowns defended well until referee Thembinkosi Dlamini blew his whistle with the two teams locked at 0-0. Buffaloes took the game to Sundowns right from the start of extra time and Phiwa thought he scored in the 98th minute only to see his headed goal chopped off for offside. Sundowns maintained their good momentum after this scare until the end of extra time. In the shoot-out, Sundowns missed through Phumlane Dlamini and Linda Maphalala, while Buffaloes scored from all their kicks. Buffaloes will face Royal Leopard in a repeat of the 2014 final which they lost 1-3.